The South Beach Diet has 3 phases. The first (two week) phase is very restrictive, whilst the second has some restrictions. The 3rd and final phase is a maintenance phase. For a complete and thorough list to refer to, get your own copy of the South Beach Diet – Good Fats/Good Carbs Guide by Arthur Agatston. NOTE: The food list is updated a number of times per year, as Dr. Agatston is continually refining the diet as new research comes to light. 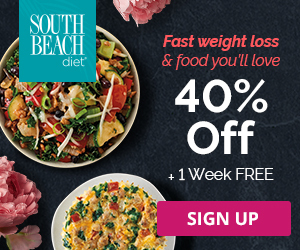 NOTE: South Beach Diet now offer a home delivery service for food – currently offering 40% off. Where the items have a line through them, this is a recent update. Vegetables – broccoli, cauliflower, celery, asparagus, spinach, tomatoes, lettuce, mushrooms, zucchini, eggplant, onions, fennel. Dairy – (fat-free or 1% milk, fat-free plain yogurt). Dairy limited to 2 servings per day. All Starchy Carbs – bread, cereal, rice, pasta, potatoes, all baked goods. Vegetables – barley, carrots, white or sweet potatoes, corn, yams, beets. Starchy Carbs (sparingly) – bagels (whole wheat), bran muffins, cereals (high-fiber, oatmeal), pasta (whole wheat), rice (wild or brown), bread (multi-grain, bran, whole wheat). Vegetables – barley, black-eyed peas, pinto beans, sweet potatoes, yams, onions, carrots. Dairy – yogurt, milk (fat-free, 1%, 2-3 cups max.) Note that yogurt can be artificially sweetened non-fat – but limit to 4 oz. per day. Starchy Carbs – all refined carbs – white breads, white pastas, white rice, rice cakes, cookies. Fruit – bananas, canned fruit, fruit juice, pineapple, raisins, watermelon. Aim for lots of water, and a maximum of one coffee (or other caffeine drink) per day. Soda should be sugar-free as well as other drink mix type beverages. While the original South Beach Diet listed decaffeinated coffee and tea in the meal plans, the New South Beach Diet Supercharged Plan says that regular coffee and tea are acceptable. Almond milk can i drink? Is mayo and or salad dressing on any Phase, but particularly Phase One? Thanx for food lists..are the foods lined thru acceptable for that particular phase of diet? Re: bananas carrots on foods to avoid list? Can you have avocado on phase 1? Can you have a plain baked potato with just salt and pepper? Can I extend phase one for a longer period. I have, for sure. That’s the phase you lose the most weight in. Can you have whey protein shakes? i like to use a vegetable protein shake including fat free yogurt, home made almond milk (almonds and water), rolled oats and spinich or a few strawberries. Would this make it as a phase one breakfast? Can you have spaghetti squash in Phase 1? So, this is not an exhaustive list here of foods you can have. You can have soy, just in moderation- like a lot of things. The point is to jump start your body into using your fat stores instead of just your food, and then continue with exercise and healthy food choices to lose excess weight. It’s not about counting calories, it is as low-sodium as you make it- because you are preparing your foods. The pre-prepared foods they offer commercially are a totally different thing and the best way to find out about those is to call them. In Phase One, can I have other vegetables than the ones listed, like okra, turnips, Swiss chard, bell peppers? Yes. Except possibly the turnips, that have a higher carb content. Did this about 10 years ago, lost 75# in 6months, great diet. Just curious…did you extend phase 1 to get more fat loss? I stayed on phase1 for about 4 weeks. Try using different cooking methods and make sure it’s fresh fish. Tuna that is fresh & Mahi isn’t fishy try grilling them add fresh herbs and spices! Hi wild salmon is great for weight loss. Skinless chicken thigh. Eggs. Have things like pasta and potatoes and pop only once every seven days. Not a proper diet if your not drinking lots of water. Have red meat like steak and lean ground beef only two days a week. Broccoli is very good vegetable. Have some cheat days like every Saturday I have small amount of pop I have pasta even have small or medium pizza sometimes on Saturday. Hope this helps. do you offer low sodium meals? The foods meet the American Heart Association’s recommendation of 600mg or less of sodium in each meal. To go lower, you will need to browse the nutrition amounts of each meal, and choose the lower sodium foods. The AHA is a political organization. Please get dietary information elsewhere. Low salt intake increases your chance of heart disease according to recent studies. Soy foods are not mentioned anywhere in Phases 1 and 2. Does that mean they are entirely a NO?